"This is so easy and very tasty. Serve on buns with French fries or potato chips." Pour can of beef broth into slow cooker, and add boneless pork ribs. Cook on High heat for 4 hours, or until meat shreds easily. Remove meat, and shred with two forks. It will seem that it's not working right away, but it will. Preheat oven to 350 degrees F (175 degrees C). Transfer the shredded pork to a Dutch oven or iron skillet, and stir in barbeque sauce. Bake in the preheated oven for 30 minutes, or until heated through. 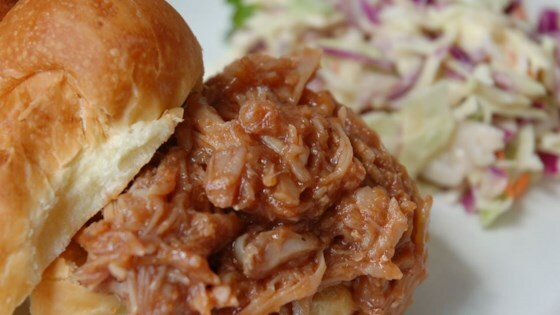 This tasty pork is great on your favorite bun. It’s simple to make, too. I used a 16oz can of BEER instead of beef broth....it was awesome. I used Cattlemans Smokehouse BBQ sauce..the best! My husband said it was the best BBQ pulled pork he'd ever had! !